Harvard’s 362nd Commencement celebration continued this sultry, summery afternoon in Tercentenary Theatre during the annual meeting of the Harvard Alumni Association (HAA). The University honored three of its citizens by conferring the Harvard Medal and HAA president Carl F. Muller ’73, J.D.-M.B.A. ’76, delivered his annual report; University treasurer James F. Rothenberg provided a financial update on the verge of a public capital campaign; and President Drew Faust and honorand Oprah Winfrey—resplendent in a crimson dress—delivered their addresses. Read the afternoon program here. In the respite between the morning conferral of degrees en masse and the afternoon oratory, honorands, members of the Governing Boards, senior faculty members, and alumni guests lunched at the chief marshal’s spread on the lawn beside Loeb House—mercifully under a tent, and well hydrated with iced drinks. Carl Muller called the 144th annual meeting of the HAA to order at 2:34—smartly attired in a light-colored jacket—no doubt sensibly reflecting his South Carolina roots. He recognized the oldest alumni attending; the graduates of the Crimson Summer Academy (the summer enrichment program for area high-school students); Stephanie Wilson (who Muller said had promised to establish a Harvard club on the moon); and Catherine (Kate) Gellert ’93, who will succeed him as HAA president. He also recognized departing deans Kathleen McCartney (from the Graduate School of Education, who leaves to become president of Smith College) and Evelynn M. Hammonds (who is relinquishing the Harvard College deanship). This year’s recipients of the Harvard Medal (see their citations here) are alumni James V. Baker ’68, M.B.A. ’71, William Thaddeus Coleman Jr., J.D. ’43, LL.D. ’96, and Georgene Botyos Herschbach, Ph.D. ’69. 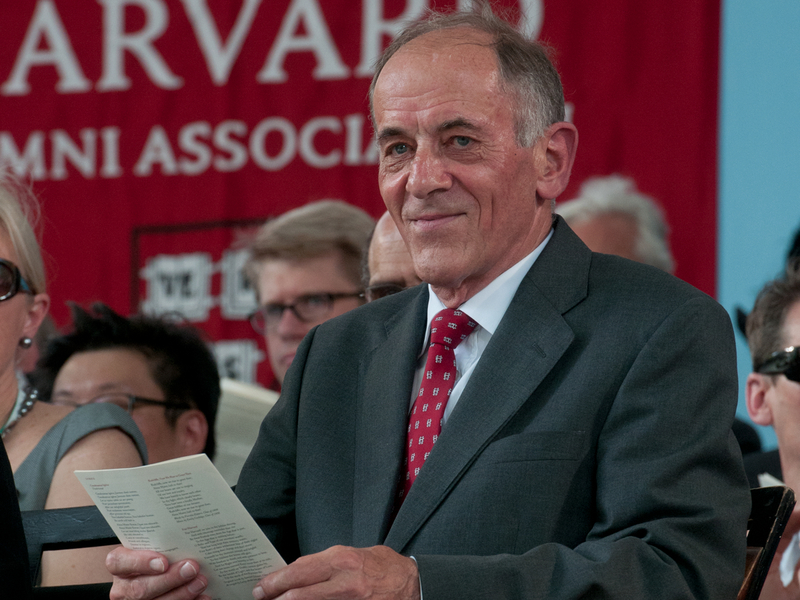 Baker, a past president of the HAA (and the first international alumnus to so serve) previously received an HAA Alumni Award for the diverse ways he has helped Harvard since starting out as an alumni interviewer in 1972. As HAA regional director for Europe, he organized a leadership conference for continental Harvard clubs that was so successful it became a model for other Harvard clubs overseas. Baker, a longtime employee of Goldman Sachs, retired as executive director of its equities division in 1996. Coleman—who was unable to attend, but was represented by his daughter, Lovida—ranked first in his law-school class, and became the first African American to serve as a clerk for a U.S. Supreme Court justice. He was also a contributing author to the 1954 case Brown v. Board of Education and later became president of the NAACP Legal Defense Fund. 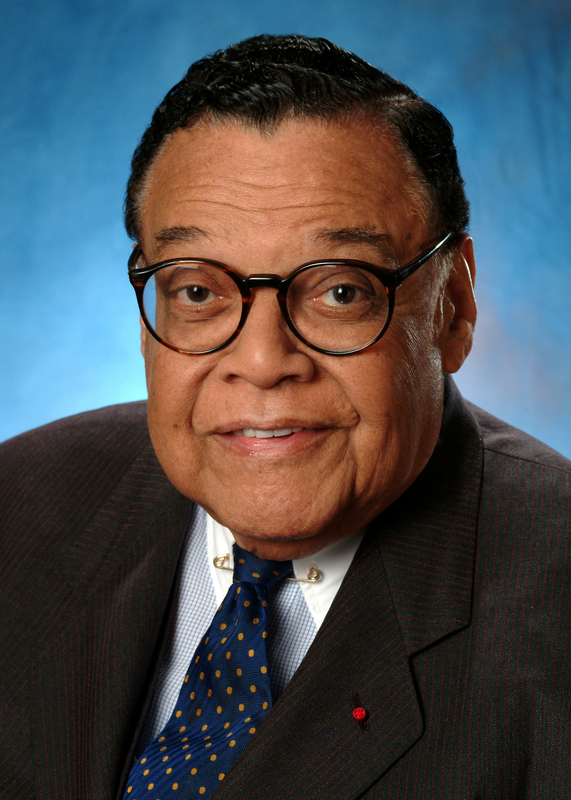 Coleman served as U.S. Secretary of Transportation and was the second African American to serve in the Cabinet. He served as a Harvard Overseer from 1975 to 1981 and has been a member of five Overseer visiting committees, as well as a member of the Harvard Law School dean’s advisory board (a post he has held since 1997). 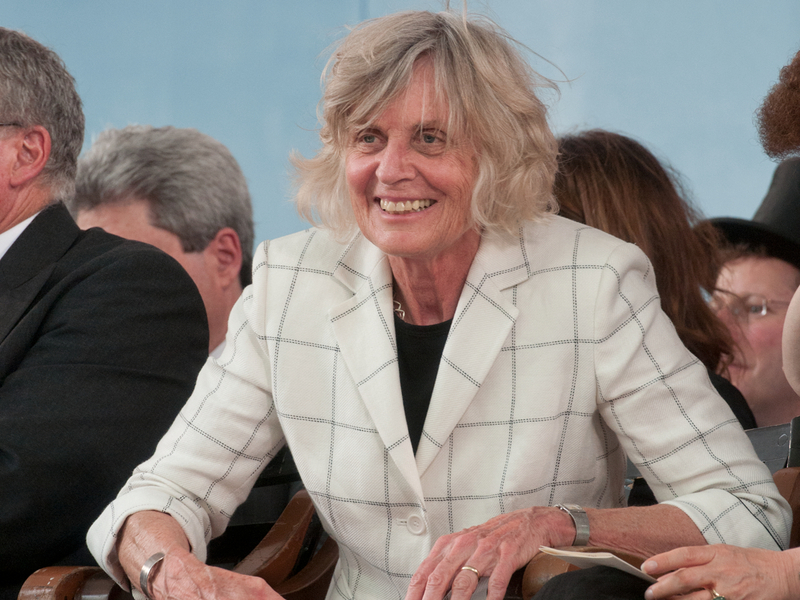 Herschbach earned her doctorate in chemistry and went on to help expand Harvard’s life-sciences programs and co-found the Program for Research in Science and Engineering, which provides summer research experiences for undergraduates in the natural and applied sciences. She has held numerous College posts—including associate dean of academic programs, associate dean of administration and finance, dean of administration—and also served as registrar for the Faculty of Arts and Sciences. She and her husband, Nobel Prize winner and Baird professor of science emeritus Dudley R. Herschbach, were co-masters of Currier House from 1981 to 1986. 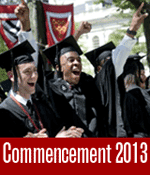 “Today is a day of celebration,” said University treasurer James Rothenberg. It is also a day of thanks.” He thanked alumni volunteers for interviewing applicants, running Harvard clubs and Shared Interest Groups, attracting people to reunions—and, dear to his heart, bringing in nearly 72,000 gifts through May 28. The only financial figure he cited was eye-popping: with four weeks of fundraising yet to go, the twenty-fifth reunion class of 1988 had raised an all-time record Harvard reunion gift of $115 million. Rothenberg also announced that more than 80 percent of the members of the College class of 2013 had participated in the class gift, and for the first time, participation exceeded 70 percent in every House–just the sort of result to gladden the heart of a treasurer on the eve of announcing a very large capital campaign. While Cambridge sweltered, the thirty-fifth reunion class playfully recalled the great “Blizzard of ’78” that closed the University in February of their senior year. Similarly for the aftermath of the Marathon bombings, where she cited the role of University security officers; personnel from the affiliated hospitals who cared for the wounded (all of whom survived); researchers pioneering improvements in trauma care; and scholarship on emergency leadership, humanistic and behaviorial aspects of terrorism; and more. Three unusual days, making for an unusual year. Yet these three unusual days illuminate and underscore the usual work of this university: calling on knowledge and research to address fundamental challenges and dilemmas with resources drawn from the widest scope of human inquiry—from the insights of natural and social sciences to the reflections on meaning and values at the heart of the humanities. Universities urge us towards a better future and equip us as individuals and as societies to get there. The world and the nation need the kind of research Harvard and other American universities undertake. We need the knowledge and understanding that research generates—knowledge about climate change, or crisis management, or melanoma, or effective mental health interventions in schools, or hormones that might treat diabetes, or any other of a host of other worthy projects our faculty are currently pursuing. We need the support and encouragement for the students who will create our scientific future. We need the economic vitality—the jobs and companies—that these ideas and discoveries produce. We need the nation to resist imposing a self-inflicted wound on its intellectual and human capital. We need a nation that believes in and invests in its universities because we represent an investment in the ideas and the people that will build and be the future. So as I report to you on the year we now bring to a close, I want to underscore the threat to universities and to our national infrastructure of knowledge and discovery that the sequester represents. Even in a year when sometimes the world felt too much with us, we have never lost sight of how much what we do here has to do with the world. And for the world. To sequester the search for knowledge, to sequester discovery, to sequester the unrelenting drive of our students and faculty to envision and pursue this endless frontier—such a strategy does more than threaten universities. It puts at risk the capacity and promise of universities to fulfill our commitment to the public good, our commitment to our children and grandchildren and to the future we will leave them. The challenges facing the world are too consequential, the need for knowledge, imagination, and understanding is too great, the opportunity for improving the human condition too precious for us to do anything less than rise to the occasion. With the devotion of our alumni, with the inspiration of our new graduates and—I hope—with the support of our nation’s leaders, we must and we will. Muller noted that Faust was from Virginia, Winfrey from Mississippi, and he himself from South Carolina—the first such triptych in Harvard history—and said that in heaven, “Our Puritan fathers are scratching their heads and wondering what is going on at Harvard.” But he noted that “Miss Winfrey” mattered as a speaker not because of where she was from, but because of who she had become. Winfrey gave a 30-minute address of inspiration, anecdote, and uplifting aphorisms, drawing on her own experience. 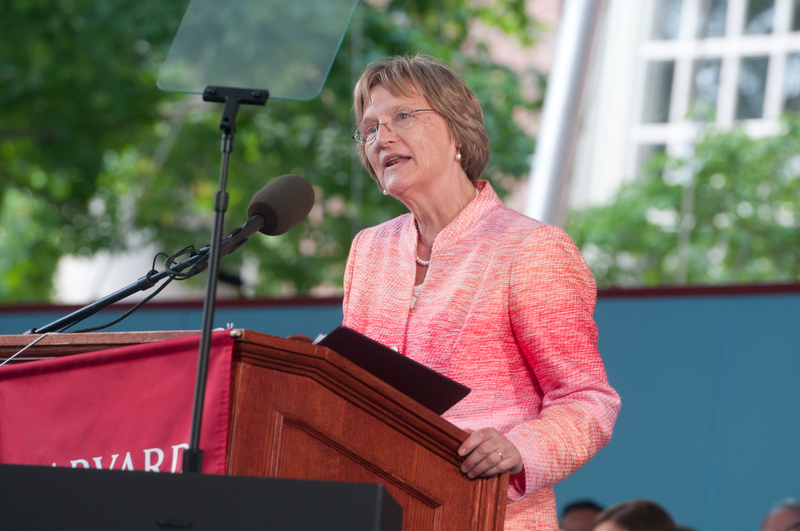 She hoped to offer inspiration to “anyone who feels inferior or disadvantaged or screwed by life—this is a speech for the Quad” (a reference to the former Radcliffe, now College, residences considered by some undergraduates to be inferior to the Houses closer to the Charles River and the center of campus). 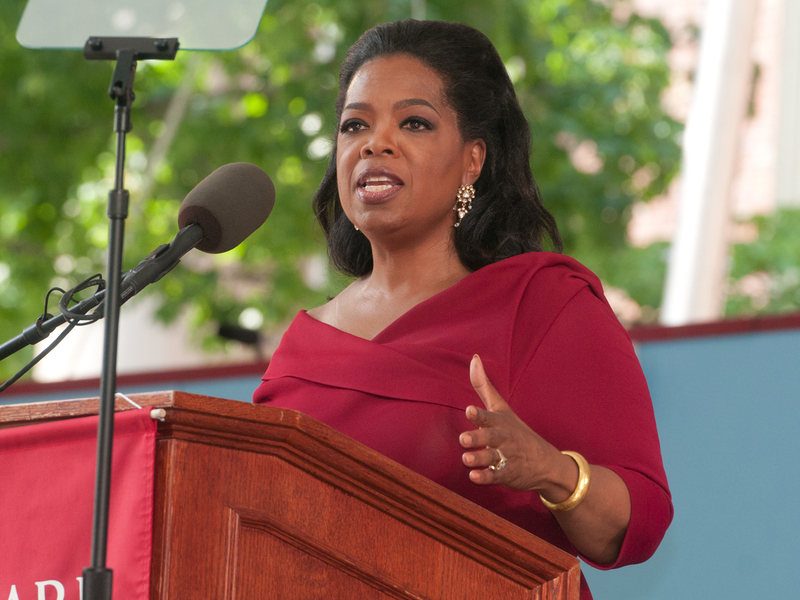 During her introduction, Winfrey said one did not have to have a Type A personality to come to Harvard (or to succeed in television), “but it helps.” Her original talk show had been an enormous success for a quarter-century, she noted, topping the ratings in its time slot for 21 years. But she felt the need for new challenges, stopped the program, and launched the Oprah Winfrey Network (OWN), only to see it become a dismal flop. A year ago, at the low point, she recalled, “the worst time in my professional life,” President Faust called to ask her to speak today. At that moment of stress, frustration, and embarrassment, Winfrey said, she could scarcely conceive of addressing successful Harvard graduates. She repaired to the shower (“It was either that or a bag of Oreos”), remembered the spiritual lyric “when the morning comes,” and determined that her professional woes would not last—that she would turn things around, certainly by the time of her Commencement address. More broadly, she told the graduates, “It doesn’t matter how far you might rise,” no matter how they might raise their own bars and push themselves, they would surely stumble and fall. Then, they must remember, “There is no such thing as failure. Failure is just life trying to move us in a different direction”–even though, from deep in a hole, it might feel like failure. Winfrey said she found her purpose in 1994, when she met a young girl who collected pocket change, ultimately amassing $1,000, to help others—an act that inspired Winfrey to call on viewers to do something similar. They collected $3 million in one month, she recounted, and established the Angel Network to fund education and build schools. That “focused my internal GPS,” she said, changing her purpose from appearing on television to determining to “use television and not be used by it.” She aimed to do so by finding the things that unite people and highlighting the transcendent nature of humans’ better selves. The media depict a country “that is polarized, that is paralyzed, and that is self-interested,” Winfrey said. But Americans are better than the cynicism expressed in Washington and the story told by 24-hour cable-news channels. A majority, she said, supports stronger gun background checks, understanding that they would protect children and not infringe on the Second Amendment. A majority wants a clear path to citizenship for undocumented aliens. And a majority “from both parties and from no party” wants indigent mothers to have access to food and shelter for their children. “What are you going to do about it?” she asked. 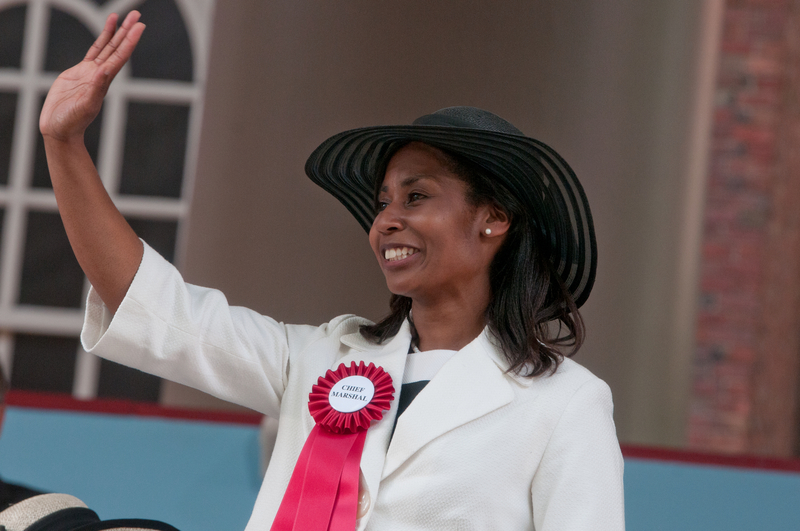 She challenged the graduates to enter public service, start their own television show, or collect their own supplies of pocket change, all with the aim of breaking down the barriers to change, drawing on the advantages of their Harvard education. “That’s where your story gets really good,” she said. The complete speech video is available on YouTube. A transcript of the speech is available here.